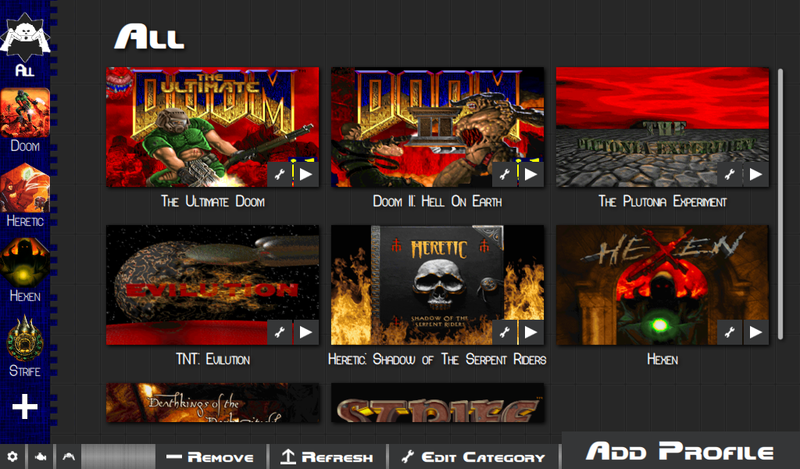 A new responsive cross platform launcher for GZDoom and similar ports based on QT. So I wanted to learn how to make a QT Quick App as well as the basics of C++ and decided that I would work on a new Doom Launcher to do this! Also Arachnotron are the best Doom monsters so naturally that was the launcher's name. This project is very, very new, but seems to be stable, please report any problems on Gitlab. Also the Settings window (gear button) is just for show, none of those settings are implemented yet. Arachnotron uses human readable json files to manage profiles into categories, these can be editing within the launcher or by hand with a text editor. My current WIP project makes use of this through git to keep the files I use in multiplayer with my friends in sync for example. Arachnotron can use paths relative to the location of the profile json file, this means that people wanting to package together several wads/pk3s can do so and include a category and profile jsons at the root of their project ready for others to import. All paths use forward slashes / even in Windows. A list of files/folders can be added to a profile in a specific load order in the profile edit page. Then on the launch page, more files or folders can be added, this is good if for example you are using several gun wads and but want to keep changing map wads as the profile resources remain unchanged, but the launch resources can be constantly changed. In the future I want to add Engine level resources for things such as brightmaps.pk3 and lights.pk3 for GZDoom, for now only configs can be set per Engine. Category and Profile icons can be included as well to make things look fancy! Profiles can have a comma separated list of category names that they are allowed to show up in (case sensitive currently). Profiles provide a list of files or folders to load as well as commonly used cvars, you can also add any other arguments you want at the profile level. An example of a profile for my project showing the cvars that are commonly used. 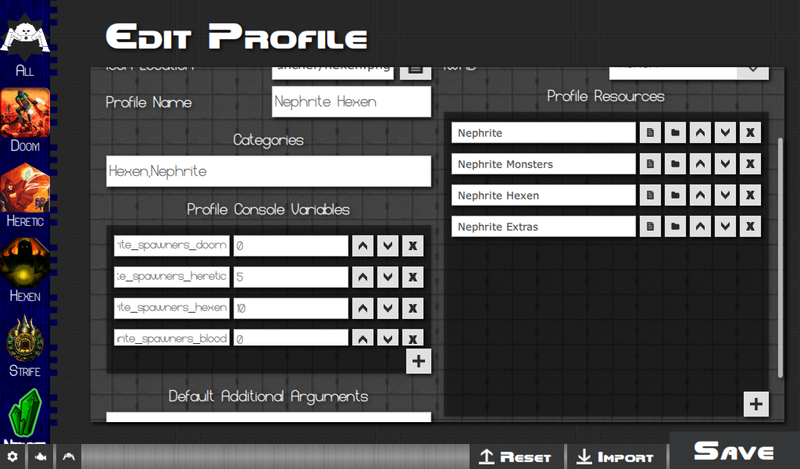 A busier edit page of my project's Hexen profile, each Resource entry is a folder name, these are relative as the profile's json is located next to these folders, absolute paths can also be used. Iwad names and paths can be set separately, profiles then refer to these by name (case sensitive currently), this allows for shared profiles to work as there are no absolute paths needed. Last edited by Lycanite on Mon Mar 04, 2019 3:51 am, edited 8 times in total. Yoooo, this is nice! 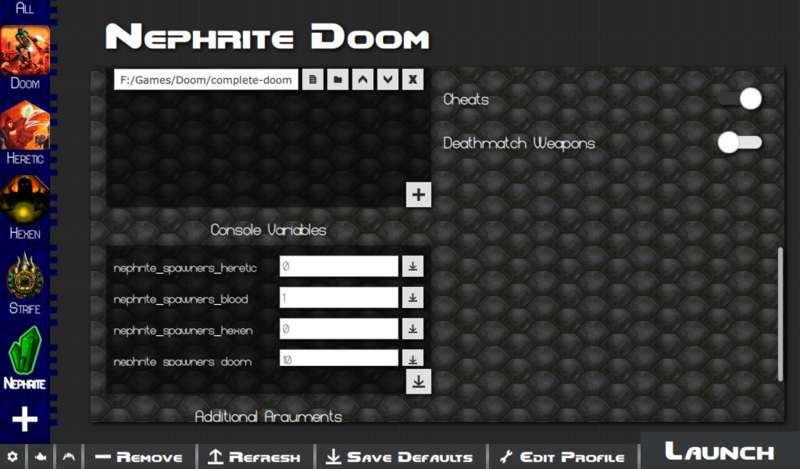 I really like this style of layout, and I'd been looking for a nice simple launcher for Doom that used it. Most other launchers just frustrate me with how they function, so I've just been using the command line. Filesize is a bit hefty for just a launcher, but it's not a big deal to me. One complaint, though-- It's annoying to have to click an entry then click launch. If you changed it so that clicking automatically launched it, and put a smaller button for options in the corner / used right-click to open game options, this would be pretty much perfect for me. PermaNoob wrote: Yoooo, this is nice! 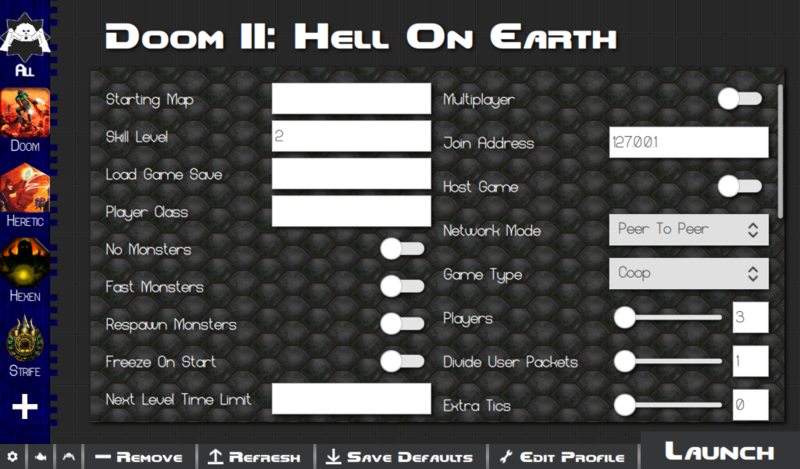 I really like this style of layout, and I'd been looking for a nice simple launcher for Doom that used it. Most other launchers just frustrate me with how they function, so I've just been using the command line. Filesize is a bit hefty for just a launcher, but it's not a big deal to me. Thanks! Yeah it uses a few qt libraries beefing up the file size but I don't think all the included files are needed so I'll look at stripping it down a bit. I'll add a little launch and edit button under each of the profile tiles for faster launching too, thanks for the feedback! Updated to 1.0.1, reduced the Windows download file size from 29MB down to 17MB and added small launch and edit buttons onto the category view. Quite intuitive and innovative to built Doom Launcher with such a GUI resembling Ubuntu Unity or Discord. That's a first plus. The goal is to make it application thinks for the user (player) so player is taking as less steps as needed and application does all the work - this is for what I advocate and suggest to be developed. The second plus comes from application being quite easy to use. User (player) click already known art title image and gets the result. First time it takes longer time to configure it, but the second time it's all set and ready to go. This is really neat. Would it be possible to pull the icon location from the titlepic lump of a wad from the launcher? blackfish wrote: This is really neat. Would it be possible to pull the icon location from the titlepic lump of a wad from the launcher? That's a really good idea! 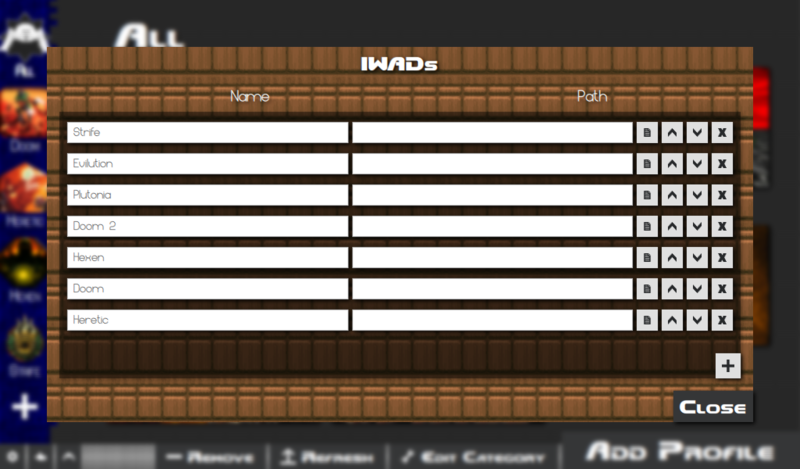 Though I have no idea how to read wads yet (very new to c++, etc) but it's definitely something I'll look at doing. Perhaps I'll cycle from the last wad/zip/folder added and backwards up to the iwad, unless a pic is manually added instead. I tell you what, this is by far my favourite launcher now. It has everything and more from what I can tell and has possibly one of the best menus I have ever seen! Now with all that, it's also very easy to use. My one suggestion for this project would be that it could be a little bit easier to add WADs and such if you could drag and drop them into the "Additional Files" field. If you can't get around to it, it's only quality of life, so it's fine. I hope you have a fruitful development path for this launcher! SoulCircle wrote: I tell you what, this is by far my favourite launcher now. It has everything and more from what I can tell and has possibly one of the best menus I have ever seen! Now with all that, it's also very easy to use. My one suggestion for this project would be that it could be a little bit easier to add WADs and such if you could drag and drop them into the "Additional Files" field. If you can't get around to it, it's only quality of life, so it's fine. I hope you have a fruitful development path for this launcher! For wads I'm thinking about add a find iwads button where you direct it to a folder with your iwads and it finds them based on common filenames, but drag and drop is something I definitely want to look at as well. 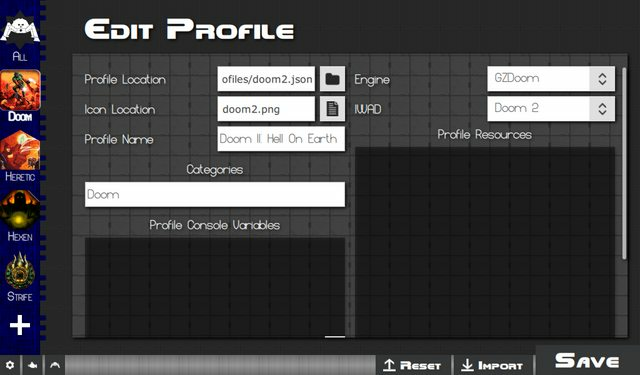 There's a few more things I want to add as well such as easier category/profile importing (good for sharing setups with friends for online play) and engine level resources so lights.pk3 and brightmaps.pk3 can be loaded whenever the GZDoom engine is used. Does this require 64bit OS? I'm trying to run it on my tablet (what I play my source ports on to play on the TV) and Win 10 is telling me this cannot run on my PC (it's a 32 bit version of Win 10). I just wanted to report that I have been able to get the project to build and run on MAC OSX Mojave. Out of the box I can launch the Mac version of GZdoom with an iwad, load custom resources, and I have tested some features like remove monsters. The only issue I have encountered is that it does not like reading and saving to the config folder. It seems to want to save everything in the root of the app package which is not how Mac typically does things. I have worked around the issue by creating a library folder for the settings and images and adding some simple logic for mac to look there. If the author would like I can generate .pkg that can create that and move the config on deployment. Also, I typically use this to play TC mods, so I welcome any additional tests people may want me to conduct. Spladam wrote: Does this require 64bit OS? I'm trying to run it on my tablet (what I play my source ports on to play on the TV) and Win 10 is telling me this cannot run on my PC (it's a 32 bit version of Win 10). Yeah the current builds are for 64bit only, I can look into making a 32bit release for the next update though. That sounds awesome, I don't own a Mac or anything so can't do it myself but if you could generate .pkgs for me that would be great! No problem, I am a professional developer and Im getting more into the game world. I know Mac very well, Windows from a hundred years ago, and I'm not to bad at Linux. I started doom about 15 years ago with Dooms-day and I think this is a very important project for the community. I've got some other ideas for other older games, I had a hard time with the registration here, but if you see me around on other forums I'll be userNam.87811 and I have that gmail as well. Ping me if you'd like, I'll be happy to help.